My training run for this Friday. 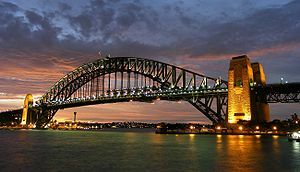 20 laps of Sydney Harbour Bridge = 24 km. Each lap is about 1.2 km, so the distance is pretty good. I like running across the bridge. Great view. The foot traffic around that time might get a little busy, and I will just have to fit in with the crowd as best as I can if that is the case. Rescheduled my training run of 24 km this week from today to Friday. This entry was posted in 10 City Bridge Run, Sydney Harbour Bridge, Training log and tagged Life Bridge, Running, Sydney Harbour Bridge. I’d love to come and walk the distance with you Matthew, unfortunately Melbourne is a bit far. However today I’ll go for a longer than usual walk instead.